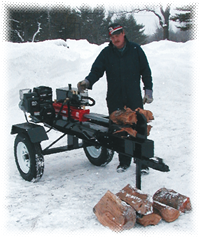 American Woodsplitters : John Stokowski & Sons, Inc.
American CLS is a manufacturer of tough and durable log splitters and wood conveyors, the finest machines on the market! American CLS prides itself in offering you the highest quality logsplitters and wood conveyors at an affordable price. American CLS with its highly skilled workers has nearly 50 years of expertise in manufacturing wood splitters and wood conveyors that last a lifetime. As a forward-thinking corporation, American CLS is continually developing solutions to address the changing needs of its customers and partners. This flexibility and responsiveness to the market needs is the reason why American CLS is able to offer an impressive selection of log splitters and wood conveyors and remain a market leader.